Keeper of the Cauldron. : Getting the temperature right. Risk is a vital component in any successful financial plan and attitude to risk is a major factor when considering how to invest. Getting it wrong can mean that the return on the investment is not sufficient, or not at the right level when it needs to be cashed in. Put the pot on too low a heat and it won't cook properly, too high and it is in danger of boiling over. No-one wants to spend their days wondering why their pot has turned out to be lukewarm and not "cooked through", nor their nights worrying whether it will boil over, or its contents evaporate into the air just when they are needed. 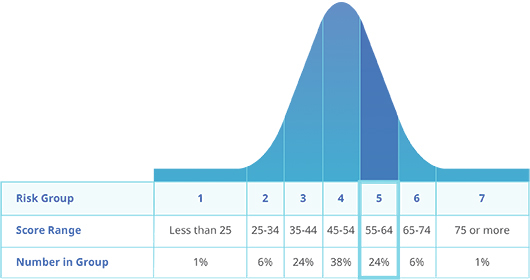 Your Risk Tolerance Score enables you to compare yourself to a representative sample of the adult population. Your score is 64. This is a very high score, higher than 91% of all scores. When scores are graphed they form a bell-curve as shown below. To make the scores more meaningful, the 0 to 100 scale has been divided into seven Risk Groups. Your score places you in Risk Group 5. In answer to the last question, you estimated your score would be 58. Most people under-estimate their score by a few points. Yours was a slightly bigger under-estimate. When compared to others you are somewhat more risk tolerant than you thought you were. However I have the feeling that this high score says more about my current stable financial situation, my lack of responsibility for dependants and my "de-mob happy" feeling of being completely debt free rather than saying anything about an underlying personality trait. In other words my risk tolerance isn't an "attitude" at all but rather a reflection of my situation (which does, after all, include a modest, but valuable final salary pension). If I'd taken the test 20, or even 10, years ago I suspect that the result would have been very different. There is a danger that the results of tests like these tend to stick with us as being true because they are supposed to be about us rather than about how we feel now, in our current situations. As such they could be in danger of being self-fulfilling, especially when coupled with the way investment types are graded into matching categories. In other words, I could take the test at 35, the result comes out as low tolerance to risk and from then on I put my money into investments that "match" my score despite the fact that 10 years later my situation is very different. Personally I have a tendency to rely on concrete measures in order to inform my mix of investments rather than let myself be led by my "attitude". Maybe it is just that I feel fairly confident that I can count on my ability to research the facts. Perhaps this is a false confidence because it sometimes feels as if the "facts" are pretty hard to find under all the "gossip" out there in the financial press. However, despite my seemingly reckless base nature (according to Finametrica) my portfolio actually has a low/moderate risk level (according to Trustnet it comes out at 78). But maybe I should follow my instinct, relax a little, let my true highly risk-tolerant nature shine through and turn up the heat. I took the test, estimated that I would get 60 and bingo! I got 60! But I think you're right - had I taken the test 10 years ago (when I still had credit card debts and not knowing the true potential of my work pension), it would have been a totally different score! Trustnet gives me a score of 81 on my portfolio, I thought it would be higher so a rebalance is in order shortly! Hi weenie, so that makes two of us who, it seems, would be able to cope with a little more heat in the kitchen and can afford to up the stakes a little. I'm still waiting for my ISA transfer to come through and wondering how to redistribute when it does. Careful thinking is required though as I do need my fairly short term SIPP to come through at the right time. (ie in 7 years or so).